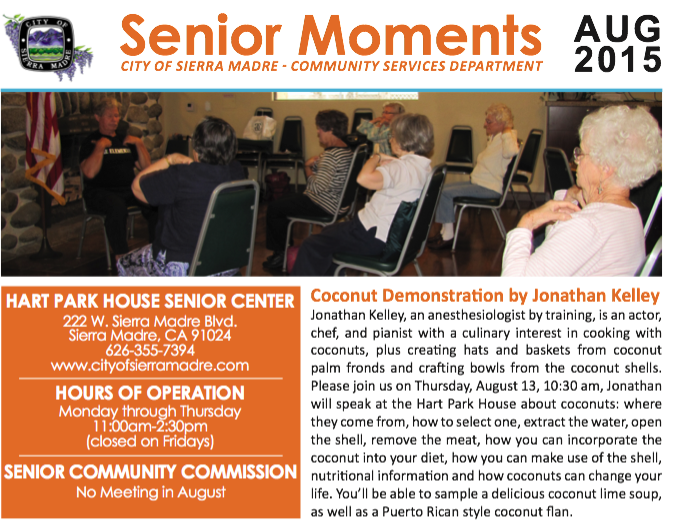 Thank you very much for your demonstration this morning at the Hart Park House of Sierra Madre. You are not only an expert in 'the coconut’ life, but you are a great speaker and a very interesting entertainer. My wife and I did not have any idea that coconuts could be so interesting. Of course you made it even more interesting interjecting some of your several achievements and successes in life, as an anesthesiologist, an actor, a chef, a pianist, etc.. Thank you very much for sharing your personal experiences with us and for teaching us so many new things in life. May God continue to bless you and your life. You guys were an amazingly receptive audience for this my first public talk on coconuts! Thank you all for your understanding when I discovered that I’d left the critical tool, the gutterspike nail for making a hole in the eyes… at home! Hope you liked the food. Thank you for your note. All Sierra-Madrini are very enthusiastic about you as a speaker, about your presentation and your indoctrination about coconuts. We will certainly buy coconuts and will know “how to choose them’ for best result. I believe that the last time we bought a coconut must have been at least 35 years ago. The last time we enjoyed their “meat” was roughly 12-15 years ago in Central America after admiring a native young man climbing a coconut tree at great speed to pick up for a group of tourists a coconut that he afterward shared with all of us as you did today. I encourage you to continue your public appearances and your presentations because they are indeed tremendously interesting: most people don’t know much about coconuts The food you prepared was outstanding, absolutely delicious. Congratulations.